SIMPLY CLEANER COFFEE Don't neglect your coffee and/or espresso machine appliance keep your coffee maker running at "Optimum Brewing Performance" (O.B.P.) every time for taste and brew temperature consistency that results in a great cup of fresh, clean, hot java! Because clean coffee/espresso tastes so much better. SMART DESCALING PROCESS Java Clean is the ONLY descaler solution on the market to have natural yellow color dye added to formula so you visually know when the brewer descaling flush process has been fully completed. Yellow to clear means you are done descaling! All other competitor coffee descaler brands are clear color formulas giving no true visual indication for when a flush descale process is fully completed. Don't guess when it comes to descaling your coffee machine be exact and precise with Java Clean Universal Coffee Descaler + Cleaner! UNIVERSAL COMPATIBLE COFFEE MAKER DESCALER (for all coffee machine brands) maintains and extends the appliance life of all coffee and espresso machines; from single cup coffee brewers, drip brewers, french press, pour-over coffee makers, coffee percolators to brands like Keurig, Ninja, Delonghi, Primula, Tassimo, Verismo, Nespresso, Hamilton beach, Cuisinart, Chemex, Capresso, Bunn, Aerobie, Krups, Mr Coffee, icoffee, Oster, AND MORE! EXTEND & MAINTAIN COFFEE APPLIANCE LIFESPAN JAVA CLEAN simple descaling process is guaranteed to remove naturally occurring limescale buildup and/or bacterial deposits that can cause expensive coffee machine malfunctions and poor coffee taste inconsistency. Avoid permanent damage to your brewer system and keep your coffee machine brewing like new! Why Descale & Clean ? Eventually from normal brew usage mineral scale deposits buildup within espresso and/or coffee brewer machine internal components causing nasty bacterial growth, affecting brew serving temperature and taste consistency. 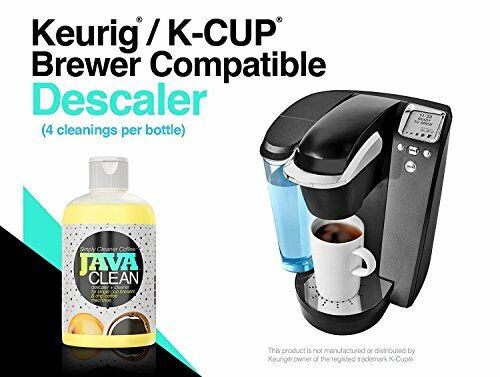 JAVA CLEAN the ALL In One Biodegradable Formula Daily Cleaner + Descaler Solution developed to clean, eliminate lime scale / mineral deposits and extend the life of your brewer for many more great cups of fresh clean java!